We value our patients' experience at Alterman & Johnson Family Chiropractors. If you are currently a chiropractic patient, please feel free to complete the following Client Experience Questionnaire. The Questionnaire is in Adobe Acrobat format, and requires the free Acrobat Reader to view. "I cannot say enough nice things about our chiropractor Dr. Alterman at Blooming Bellies. She kept my body healthy during pregnancy, and today she drove all the way from the beach to our home to adjust my baby and me. She went above and beyond and worked with him and his issues nursing, and she was so helpful in more ways than adjustments. If you are looking for a Webster certified pregnancy chiropractor, she is the one to go to. They truly care for their patients." After years of infertility, my husband and I finally conceived in January, 2011. We couldn’t have been happier! Having been waiting for this precious gift for so long, we were determined to do everything we could to have a happy, healthy pregnancy and birth. After doing a great deal of research and carefully weighing all of our options, we decided that a home birth was the best decision for our family. For us, the risks of having our baby in a hospital, including a medicated birth, a surgical delivery, interruption of the bonding process immediately after birth and unwanted and unnecessary procedures being performed on our baby far outweighed the risks of a home birth. After years of infertility, my pregnancy was a sign of health and we saw no need to see a doctor or go to a hospital unless there was a problem. As such, we chose Fruitful Vine Midwifery Service for our care providers. My pregnancy was going smoothly with no complications. I ate a healthy diet and remained active, attending group fitness classes several times a week and walking and swimming throughout the pregnancy. Around 28 weeks, however, I began to have significant back pain. I was unable to sit down for more than a few minutes without becoming really uncomfortable. It didn’t matter where I sat—in the car, at the kitchen table, on the couch, in bed propped up with pillows, on the floor, etc.—it was all painful. I initially went to see a general massage therapist. The massage was nice, but did nothing to relieve my back pain. I then saw a massage therapist who specialized in pre-natal massage. She performed a neuromuscular massage, which was helpful, providing relief for several days. The pain always returned, though, and with the same intensity. I became very concerned that the degree of pain would become increasingly worse as my pregnancy progressed and I still had almost three months to go. Dr. Alterman came to make a presentation to our Bradley Childbirth Class. To be honest, I had always been somewhat skeptical of chiropractic medicine. However, my husband really convinced me to give it a try. “What do you have to lose?” he reasoned. So, somewhat reluctantly, I made an appointment. Dr. Johnson gave a short educational presentation and Dr. Alterman took a complete history and performed a thorough physical examination. After looking over the results, she determined that it was likely that I had several subluxations throughout my neck and back and a tight psoas muscle on my right side. She thought she could help. After just one or two adjustments, I felt markedly better. It was like a miracle! The back pain was all but gone. I could once again comfortably ride in a car, sit at the dinner table and do work at the computer. And the pain did not return for the remainder of my pregnancy, despite my ever-growing belly. In addition, the pain I’d had in my left shoulder since graduate school also eventually resolved with treatment. When the time came for our precious daughter to be born, I came into the office for an adjustment in the early part of my labor. At 1:11 the following morning, on September 29, with the help of my midwife, doula and wonderfully supportive husband, I gave birth to a beautiful, healthy daughter, Kelsey Marie. We were blessed to have the natural, unmedicated home birth that we’d hoped for. My personal experience with and the education I received from Alterman and Johnson Family Chiropractors has made me a supporter of chiropractic care. So much so, that my daughter is now a patient in the practice and had her first evaluation when she was just two days of age. I couldn’t be happier with my experience and I know that Dr. Alterman was instrumental in helping me have a more comfortable pregnancy and a healthy, natural birth. Lydia's arrival into the world was a very memorable and quick experience. I was 3 days past my due date and feeling like she was NEVER going to come! On Sat. morning I was so convinced that I was going to go 2 weeks late like I did with Will and I was not happy about that. I had lots of contractions on other nights( for 3-4 hours at a time)and each time they stopped soon before bed. I was very frustrated that it just didn't seem to be happening. The pregnancy had gone very well, easy in fact except for being tired. I had been seeing a wonderful chiropractor, Dr. Alterman, who had helped my back pain from Joey's very long labor and birth to go away. She had given me adjustments and assured me that I was all lined up and my midwife said the same. So I knew baby was ready and I was ready but still baby stayed all cozy in the womb. By Sat. afternoon I had given up on the thought of baby coming that day and decided to just sit and read with my husband while he rubbed my feet. At dinner time he decided to grill up some chicken for dinner. He was outside grilling when I started getting really, really strong contractions. I didn't think at first that it was really labor because I had had contractions a lot before in the evenings and they went away but these were really bad ; the doubled- over- crying- in -pain kind. It was about 7pm. I went outside and told Michael that I thought maybe this was it. He said, "Yeah, we will see. Give it a few hours." A few minutes later I came back out and told him, "We NEED to call the midwife NOW!! It's really bad!!" We called and Katie said she was on her way. I got into the tub while Michael took the chicken off the grill and got the kids some snacks and into their beds. The kids did an excellent job of helping with Ella and Joey and being very quiet. About 5 min. later the birth assistant, Tanya, arrived and began setting up things. I was so relieved to see her. About 15 min later the midwife, Katie, arrived and she checked me and said I was at 10cm and asked if I was ready to push. I pushed 3-4 pushes and with the last push the baby's head crowned and she came out. She put Lydia up on my chest. I was in shock for a few minutes. In less than an hour and a half we had our sweet baby that I thought would never come. And we were going to now find out if we had a boy or a girl. Michael and I looked and saw we had a sweet little girl!!! We were so excited!! Talk about a lot of emotions!!! I got out of the tub and we called the kids in to meet their new baby sister, Lydia Jane!! Recovery was so much easier this time. I got my strength back quicker and was able to be up and doing things sooner than my other births. And no back pain! I am praising God for so many answers to prayer in the safe, quick and easy labor and delivery( my shortest and easiest labor yet) of Lydia and that she is so healthy. I thank God for a wonderful husband who was calm and praying and encouraging through it all, children who were so helpful and little prayer warriors, wonderful midwives at Fruitful Vine, who are calm, helped me throughout my pregnancy, know exactly what they are doing and made it here in time, and a great Chiropractor who helped me not just feel better throughout my pregnancy but also have an easy and quick delivery of Lydia, our 6th child. 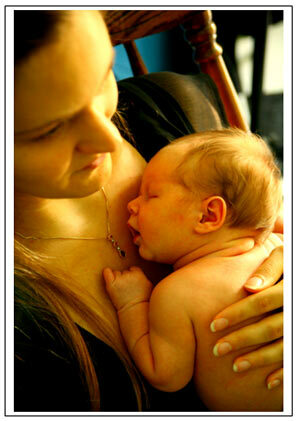 I first heard of chiropractic from my midwife, who recommended that I see Drs. Alterman and Johnson when I was 24 weeks pregnant. At that time, I was experiencing severe lower back and hip pain, and I had a long-standing neck problem, headaches and tingling in my arms. As a mother of three (and pregnant), the pain made it difficult for me to care for my kids, and walking was especially painful. Dr. Johnson was a God-send – because of the results I had, I decided to bring my children in for care as well. I started to notice improvement in how I felt right away, and the improvement continued steadily. 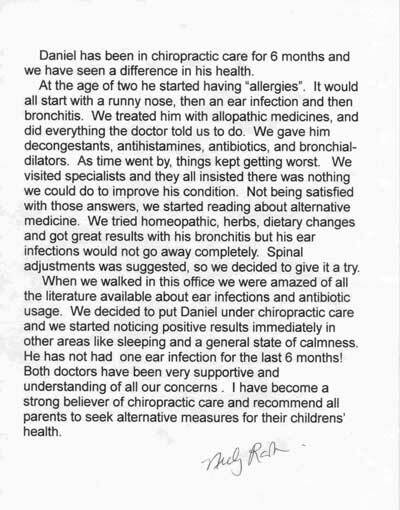 For my children, prior to receiving chiropractic care, they were frequently sick. Now, we rarely visit the pediatrician, other than for well visits. Both my health and my children’s health have improved so much! I definitely recommend chiropractic care for others. I know for me and my children, coming to Alterman and Johnson, Family Chiropractors, has changed my life, health and the way we view our bodies. I encourage anyone with health problems to come here, and bring your children. You will see a difference! My midwife recommended I see Dr. Alterman for rib pain and numbness during the second trimester of my second pregnancy. I had never received chiropractic care before, but I was determined to find relief without taking medications that would affect my growing baby. After just a few visits, we found that stretching the psoas muscle completely relieved my rib pain and numbness. Dr. Alterman also found that my pelvis was out of alignment, which could make my labor and birth longer and more difficult. I chose to continue with chiropractic care through my pregnancy as a means of caring for myself and preparing for birth. I am convinced that my pelvis was misaligned since before my first pregnancy. I labored for over 42 hours with my first baby, who was malpositioned in the womb. The birth of my second baby, while under Dr. Alterman’s care, is a completely different story. I labored for less than three hours, with my baby in the most ideal position for birth. As a matter of fact, my husband and I planned a homebirth, and our midwife was unable to make it to our home before my baby was born into his father’s hands. Chiropractic care has been life changing for me. I have learned another way to care for myself and my family that is completely natural. Both my newborn and I continue to see Dr. Alterman, and her care and knowledge transcend pregnancy. She has helped with postpartum challenges such as breastfeeding and mastitis, and newborn concerns such as nasal congestion and digestion. I recommend Dr. Alterman to anyone who is pregnant, and especially during those challenging few weeks after giving birth for both mothers and their newborn babies. 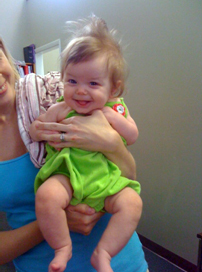 My daughter E. was 14 months old when I first brought her into the Alterman and Johnson Chiropractic office. I had been a client myself for a few months with fantastic results and, although babies and children were a familiar sight in the office, I had never thought to bring my own child. A relative of mine was studying chiropractic at Life University and had shared some literature with me about the benefits of adjustments for children and babies, but I just didn't think it was for E.
My thoughts shifted when E. began to get ear infections - three within six months. She was treated with antibiotics by our regular pediatrician for the first, which I felt uncomfortable with but rolled with it; then progressively stronger antibiotics for the second and third. Knowing that she may soon grow resistant to these antibiotics if we continued down this road, I inquired as to what would be the next step should she get yet another ear infection. Without blinking an eye, the pediatrician replied "Oh, she would just get tubes in her ears. Don't worry, it's only a half day outpatient surgery." For me, these were incomprehensible words. I don't even like taking Advil! I never took any medicine during my pregnancy, labor, or delivery. I breastfed my daughter for a year, one of the many reasons being that I had hoped to build up her immune system as best I could. We all want what is best for our children, and tubes have probably worked wonderfully for some children and parents. It just was not the right choice for us. I came across some literature while waiting for an adjustment one day, and there was the answer, clear as day - "regular adjustments have been shown to reduce or eliminate ear infections in young children," complete with all the evidence to back it up. "Why not give it a try?" we thought. We are all for holistic medicinal options in all other areas of our life; why not teach our child the same? I will admit that I did not know what to expect for E.'s first adjustment, and neither did she. Dr. A came in with the activator tool and showed E. how it worked and even let her play with it a bit. She then laid E. down and "click, click, click" - she was done. Dr. J has also adjusted E., and they have their own little routine of passing the activator back and forth and giggling throughout the adjustments. E. calls it "Click-click" and always says "More?" when we're all done. We started with three adjustments per week, then went down to two, then one, then twice a month, then once a month. The doctors educated us about how the adjustments were helping to keep her tubes open to keep the liquid draining freely, and happily answered any questions we had. There was even a free workshop on the topic. We also switched her from cow's milk to almond milk, which I personally think also had a lot to do with her increased health. I don't think it's any coincidence that her ear infections came on as we weaned from breast milk to cow's milk. Our son Christian is 4 years old and has always had problems with constipation. When he was a baby, I tried giving him more fiber, thinking it was his diet. When potty-training time came, I thought the problem may be his busy nature… many moms told me that Christian was just too busy playing to want to go to the bathroom. Potty training was really difficult and took almost 2 years. By the time he was 3 and ½ he was potty trained when it came to “going number one”, but with “number two” it was always difficult, he refused to use the potty, and he held it for days. Unable to go in the potty, he always had accidents, and was very anxious about the entire process, often bursting into tears when I asked him to go sit on the potty. We tried everything, from reading advice books, to being laid back about all of it, to being firm. We tried every different type of reward to offer him. We tried adding more fiber to his diet, giving him more fluids, and talking to lots of other parents about the issue. Many parents related similar problems with their kids, and confessed that the problem often persisted well into childhood! I was at my “wits-end”. At Christian’s 4 year-old check-up, I mentioned his problems with potty training and constipation to his primary doctor, who prescribed a stool softener, and suggested I spend a few minutes each day with Christian on the potty, reading a book. I faithfully did as she suggested, and ended up with a child with diarrhea.. the problem was still not solved! Finally, in frustration, I mentioned all of this to Dr. Alterman during one of my prenatal adjustments. Dr. Alterman told me she could help Christian with this problem and mentioned she has treated several other children for the same issue. I was ready to try anything at this point, and I started bringing Christian to see her. I wasn’t sure if Christian would cooperate with Dr. Alterman’s exam or adjustments, but she put him right at ease, sitting on the floor to talk to him, examine him and show him the instruments and table. Christian was very cooperative with Dr. Alterman right away, and I was stunned. One day, less than a week after his initial exam, after only two adjustments, Christian told me that he needed to “go potty”. I suggested we go sit on the potty and for once, no tears! Then, a miracle.. HE WENT #2 IN THE POTTY ALL BY HIMSELF! And now, for three weeks, Christian has consistently gone to the potty by himself and hasn’t had ANY ACCIDENTS! For a Mom who has been cleaning up accidents and worrying about my child for two years, to say this is a “relief” doesn’t really capture it… it’s a miracle. I’m forever grateful to Dr. Alterman and the entire staff. You’ve truly changed all of our lives. 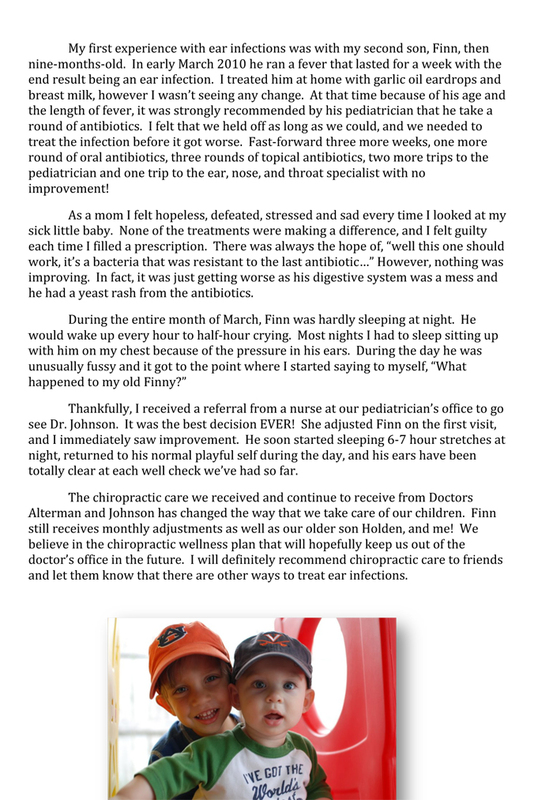 I can’t stop telling anyone who will listen how Dr. Alterman cured my little boy. And I’m a true believer in Chiropractic and will be for the rest of my life. THANK YOU ALTERMAN & JOHNSON FAMILY CHIROPRACTORS! The day before Thanksgiving 2010 we were blessed with baby Devyn. 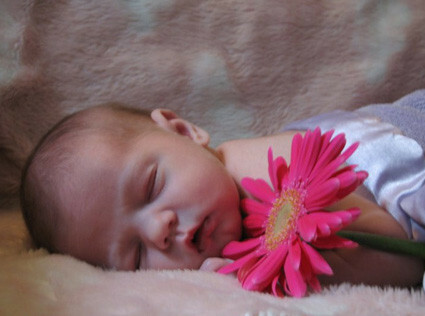 She was born at 36 weeks gestation with no complications. Upon birth and weeks following we noticed that Devyn's head was shaped odd. One of her eyes seemed a lot smaller and the ear on that same side seemed to protrude. Around the time she was 5 weeks old, nursing had become complicated, she seemed apprehensive about nursing. It seemed especially more difficult on the side with the strange features. I then realized she might have torticollis and took her into the pediatrician immediately. By this time she was 8 wks old and nursing was almost impossible. She cried all day and would refuse to latch on longer than a couple of minutes at time. A normal feeding session involved 30 minutes trying to nurse, then eventually just pumping and supplementing through the bottle. The pediatrician assured me I was being paranoid, and that all of my concerns would eventually resolve as she got older. At 13 weeks, I was beginning to lose my sanity. Emotionally I could not stand to go on with breastfeeding anymore. At this point I had seen 2 different lactation consultants; again neither could give any real help. One recommended Craniosacral Therapy and Chiropractic care. But it was too late, I had already weaned. The first 24 hrs on formula Devyn completely transformed into a normal happy baby. I was distraught. Yes I was happy with her results, but completely heartbroken that I couldn't supply what she needed. I had never weaned before 12 months and after 9 days on formula I decided I would begin the re-lactation process. I wasn't going down without a fight. I went two entire weeks pumping close to no milk and never getting my baby to latch. I was determined and would not rest until I had exhausted every option available. I was taking close to 50 pills a day to help my supply, I was paying out of pocket for formula, consultations, renting pumps and not sleeping. I cried every time I gave my baby a bottle wondering if there was any real hope. Another week passed with no results and I didn't think twice about craniosacral therapy and the chiropractor. Devyn had her first session of CST on a Thursday, and her first consultation with Dr. Alterman that very next day. Meeting Dr. A was a breath of fresh air. Almost immediately she noticed Devyn's head, her ear and even her neck being different. I don't remember much about that day other than Dr. A asking me when Devyn had been dropped. She had kindly shared with me that she had never seen such trauma in a baby who had not been accidently injured in some way. She had subluxations in her hip, her upper back, her shoulder, her neck and she also noted overlapping cranial bones in her head. I was a wreck when I left her evaluation, and came back later that afternoon for Devyn's first adjustment. We noticed results almost immediately. That weekend Devyn went from not latching at all to randomly nursing a few minutes here and there. Devyn was scheduled for 3 adjustments the following week and I was so excited to see her progress. By this time my supply was no longer an issue because I had spent plenty of time regulating it. I was working hard around the clock. By Devyn's fourth adjustment the progress was miraculous. Dr. A recommended going cold turkey off of the bottle. She will be 6 months old on May 24th and Devyn has been bottle free for over a month now. It doesn't end there though. The progress continued. Shortly after her 4th adjustment, she began to exert bodily movement. Up until this point, she would only lay still flat on her back. She wouldn't try to roll, kick her feet, or even bat her arms at toys. Within another week, Devyn was rolling. And soon to follow, she was kicking her legs and even beginning to bat her little arms around. The best way to explain it is by saying she feels so loose and relaxed now! If you asked me 6 months ago I would say that chiropractic care was for the naive. Ask me today, and I will tell you it forever changed our lives. Thank you Dr. Alterman for helping my precious baby! Miracle was born as a footling breech c-section; other than that, she was perfectly healthy and breastfed within the first hour of life. From the beginning, she always had a problem with sleeping. In her first weeks and months she would only sleep if someone was holding her or if she was being rocked in a swing. By six months old she had given up taking naps in the daytime unless she just passed out for exhaustion. As the years went by her sleeping patterns got worse and worse. 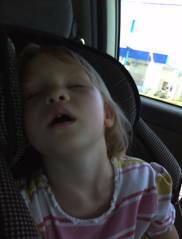 By age three she was staying up until midnight or 1am every night and was only going to sleep by passing out; kicking a screaming until she did. We tried everything to get her sleep pattern under control: night time routines, baths, oils, herbs, punishments...nothing worked. She wanted nothing to do with our chiropractor and screamed, cried and kicked....not allowing them to touch her much less adjust her in any way. When I became pregnant with my 5th child and started to have pelvic pain (which I also experienced with my pregnancy with Miracle and my chiropractor did not help), my good friend suggested it was time for me to switch chiropractors. I started coming to see Dr Alterman at 22 weeks pregnant and had very quick relief in my pelvic pain. When at 30 and 33 weeks this new baby was transverse and then breech, coming to see Dr A regularly got her head down quickly and I have no fear of a repeat of my last birth. I was amazed and knew I wanted my whole family to switch over to Alterman and Johnson as soon as possible. At Miracle's first visit to see Dr A., I had no idea how she would react and I told the office staff that it was really just a test to see if we could get anyone to even touch her, much less assess her and possibly adjust her. When Dr A. asked if there was anything related to Miracle's health that we would like to see a change in I laughed and said I just wanted her to sleep. I really did not think chiropractic care could help with her sleeping patterns. Dr A. did not promise anything, but was wonderful with Miracle and got her to participate in the assessment, which alone floored me. A few days later we were back for her results and her first adjustment. Once again Dr A took extra time and care with Miracle, making her feel comfortable and got her to completely cooperate with her for the adjustment (the promise of a Juice Plus gummy never hurt either)! That night I was amazed!! Miracle went to sleep at 11pm! I know that doesn't sound like a lot to most people but that was 1-2 hours difference to us. Went back for the next adjustment and Miracle hopped up on the table and was ready for her “clickies” on her back. She went to bed at 10pm. By the second week, 9pm with a day time nap!!! All along LOVING coming to see Dr A and getting her “clickies” and her gummies! All of this by itself would be wonderful, but it is not just that Miracle is going to sleep earlier and sleeping better. It is her attitude toward sleep. No more kicking and screaming. No more hopping out of bed and fighting. She readily lays down for bedtime. Chiropractic care is the ONLY thing we changed with her and it has made me into a believer that not all chiropractors are the same and that chiropractic care can help in so many more ways than just pain management. Every new mommy discovers some “secret treasures” for her little one that prove to be lifesavers! 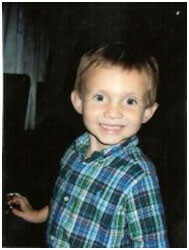 For my baby boy, Jesse, my treasure was chiropractic care. I may never truly know the full value of his care. I am confident that chiropractic is starting him on a path to health. While pregnant, I had heard of Dr. Alterman and Dr. Johnson from my Bradley instructor. The emphasis for chiropractic was on the mommy-to-be and how it could benefit her pregnancy and a natural labor. I decided that I would definitely consider it if Jesse turned out to be breech. As this didn’t occur, I put the idea on the back burner until Jesse was born. 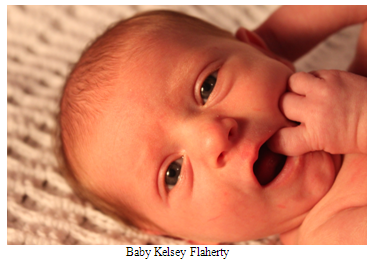 While he was not breech, he was somewhat malpositioned during birth, which led to a rather long pushing stage. At his first check-up with his pediatrician, she suggested we reconsider chiropractic care – that she felt it would be a good thing to get him realigned after the birth. “He could go on a gassy, colicky path based on what you’re telling me,” she said. “Chiropractic could get him on a path towards less gas and better sleep.” Again, my husband and I considered it, but weren’t convinced that he needed it. 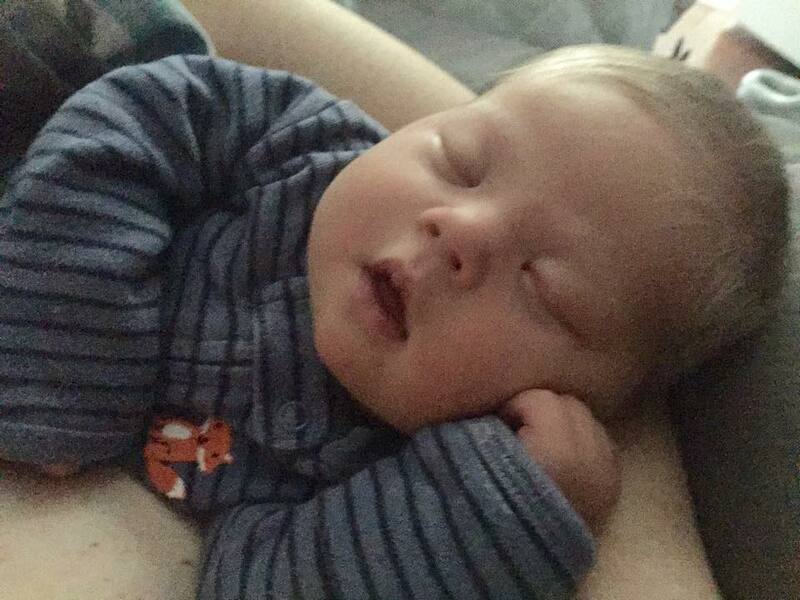 Over the first five weeks of his life, we went through several nights during which I could tell he was gassy, tired, and just plain uncomfortable. He woke up often, and was not getting good sleep. He would literally be up every hour. Then we went through an entire week of no sleep during the night. He was miserable, and I was drained! Off the back burner and to the forefront came Drs. Alterman and Johnson! I was starting to believe it just might make him feel better. After his very first adjustment at six weeks old, Jesse slept through the night for the very first time. He has been getting adjusted now for six weeks, and no more painful gas or sleepless nights! He is much happier and playful during the day. I am so grateful I was able to do something to make my baby healthier and happier. I would recommend infant chiropractic to anyone. Thanksgiving this year has a special meaning for me. Of all the blessings that I have received this year, the one that stands out from the rest is the great fortune that Dr. Diane Johnson has brought to my life. When I came to her office last summer, I was in more pain than I have ever experienced. I had my usual lower back pain (caused by scoliosis and arthritis), but even worse, I had damaged both rotator cuffs in my shoulders while experimenting with new exercise machines and weights at my gym, without the benefit of the advice of a trainer, which I could have easily received. My fault, lesson learned. Needless to say, my range of motion in both arms was limited to that which didn’t cause extreme pain, and most any movement caused me great pain. At the same time, my arthritis caused both hands to swell and stiffen, so I was nearly totally incapacitated. And did I mention the stiffness in my neck? Turning my head in either direction was impossible. Dr. Johnson started my treatment with a combination of massage and chiropractic adjustments. From there we added an exercise routine that helped me to retrain my muscles and ligaments to function normally. Over the course of a few months, I began to feel better and better. My arthritis subsided, the shoulders healed, and I began to live the healthy life I was used to. I still take the supplements Dr. Johnson recommended, which provide pain relief as well as nourishment for my joints, and I still do the exercises she taught me. As I said, Thanksgiving has special meaning for me this year. Dr. Johnson is a wonderful doctor, but more than that, she’s a truly caring person and I am forever thankful that she is in my life. From: Michelle Mancuso After 5 years of my back pain getting worse and 3 different physical therapy offices, a friend of mine recommended seeing a chiropractor. It was the best decision I ever made. After a few adjustments I have been able to do things I haven't done in years without any pain. Standing, sitting, laying down, and just plain out being able to relax have been some of the changes. Walking my dog aroud the block, cooking dinner, and spending time with my husband have all been so enjoyable since the pain I was experiencing has diminished since seeing Dr. Alterman. I can't believe I have spent the last 5 years of my life on medication to mask the pain and physical therapy that wasn't helping the problem. At 27 I feel like I have gotten my life back again. Thank you Dr. Alterman! I have been under your treatment for only several months and already I can see dramatic changes in how good I feel from the adjustments and the exercises you have shown me. Prior to coming to your office I had a severe pain in my shoulder which was the result of a fall which just wouldn’t heal for over six months. I was afraid I would eventually need surgery to correct the problem and help the pain subside. After the adjustments you performed over the course of the first month the pain started to subside and now I am pain free for the first time in many months. I can even lift weights now due to the treatments I received from you at Alterman & Johnson. In addition, the neck pain I have whenever I ride my motorcycle for long periods has gotten much better and I certainly attribute that to the treatments you have given me. I’m very impressed with the level of professionalism and care your practice provides and look forward to further working with you to clear up the subluxation in my neck. Thanks very much for all the excellent care you provide which promotes total body healing in a natural way. It’s most appreciated and my body also thanks you very much. For many, many years I suffered with migraine headaches and really painful tension in my neck and back. I just assumed it would go away on its own but finally at the age of 28 I sought treatment. I called my insurance provider, who referred me to doctors Alterman and Johnson. 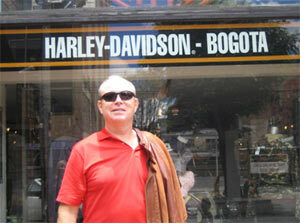 I began to see Dr. Alterman for my treatment plan. After sticking with the treatment plan that Dr. Alterman had come up with, all my tension problems and headaches have completely gone away. I would recommend chiropractic care to anyone who feels pain that is simply unbearable, and, if I had to recommend a doctor, I would and will suggest Dr. Alterman for the treatment.